Canada's health system is a tangled, highly fragmented network that often wastes a great number of resources by duplicating efforts, leaving unaccountable gaps, and failing to build on the strengths of our health professionals and clinical expertise. 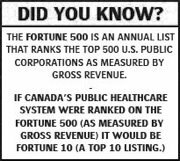 Even though Canada’s health care delivery carries a significantly higher price tag than more than most other industrialized nations, Canadian’s only receive only about half of the recommended care for that investment. With an aging population, extended wait times, and chronic conditions reaching epidemic proportions, our healthcare system will not survive without radical change. According to Frost & Sullivan , increasing integration is creating the need for a single point of contact to healthcare IT (HIT) systems, which in turn, is driving the eHealth market. eHealth, the application of web-based information technology to healthcare, can profoundly change the way the business of healthcare is conducted—making it safer, more affordable, and significantly more efficient. However, transforming traditional modes of delivering care will require Health Care Organizations (HCO) to take advantage of the enormous potential offered by information technology in far more complex ways. Previously, eHealth was stalled by interoperability issues and a lack of workflow-driven, secure information exchange. Today however, progressive technology and innovative solutions are enabling unprecedented advancements. The relatively brief history of Health Information Technology (HIT) has taught organizations the high costs of failure, which has caused Health Care Organizations (HCO’s) to prudently proceed with guarded optimism. Although there is recognition of the benefits of eHealth, when combined with a market already crowded with HIT vendors attempting to help HCO’s realize a return on investment (ROI,) it becomes increasingly difficult to identify a vendor with a meaningful track record. As such, the majority of Health Care Organizations have been watching the progress of vanguard organizations before they commit their time and money. Waiting to join the eHealth movement has its own disadvantages. Besides prolonging current inefficiencies, laggard organizations may miss an important window of opportunity, and the benefits of adopting eHealth strategies are too great to ignore. For HCO’s determined to take advantage of the current Infoway-driven EHR environment, the next imperative action is to outline an appropriate technical platform for their eHealth strategy. Fundamentally, organizations are seeking a platform that allows the seamless delivery of information across the continuum of healthcare. Fortunately, this objective can be met without cost-prohibitive, universal replacement of existing HIT. Moving forwards with a portal communications strategy can bind the information technology of disparate facilities and stakeholders into an interactive user community using advanced, but proven, web portal technologies. From the user perspective, a web portal is any technology that allows an individual or user community to gain convenient access to a broad range of information and services through their web browser. Most HCO’s serve a variety of stakeholder communities, including providers, payers, patients, employees, and consumers. Each of these stakeholder communities benefits from a portal that is targeted specifically to their needs, aggregating information of value for them and allowing them to communicate freely with the host organization and each other. For the hosting HCO, a portal is an integration tool that incorporates service and data management applications with workflows and business processes to present a unified, personalized, and streamlined gateway to their enterprise for its stakeholders. The HCO establishes a portal strategy to offer timely access to real-time information resulting in better customer service that is accessible from a single point of entry, regardless of which system generates the information or where the information resides. While a provider portal, patient portal, employee portal, and a consumer portal each appear independent of the other, they are clearly interrelated. Since healthcare consumers may be patients, employees, or even providers, their needs will overlap. Therefore, each stakeholder may require access to the others’ data as well as additional common data sources. A portal solution can serve to aggregate information stored in disparate, incompatible systems using a Service-oriented architecture (SOA). SOA describes a product architecture that allows tight integration with underlying applications, without requiring system interoperability. This also allows users to access software functions independent of the underlying platform and/or programming language. It permits services to be rolled into larger applications that can be incorporated into portals, without locking the enterprise into a specific vendor. While the SOA concept has been around for quite some time, emerging standards-based integration technologies like Web services and XML have just recently made it practical. The benefit for your healthcare organization is clear ---a SOA enables eHealth while protecting the enterprise’s investment in legacy software. As organizations search for viable tactical path to leverage a service-oriented architecture, many can use portal products as a first step. 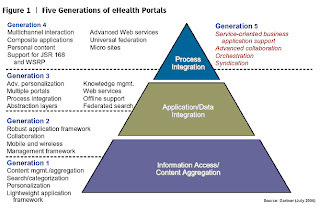 The Gartner Group has identified five levels of eHealth development using Portals, the elements that comprise them, and what it takes to move from one level to the next (see illustration Figure 1 below). Health Care Organizations continue to significantly use portal products to build and deploy a variety of customer, citizen, partner and employee-facing enterprise portals. Portals have evolved through four generations of technology and are embarking on their fifth generation. In the beginning, eHealth bore relatively simple websites that provided new levels of information accessibility to healthcare consumers. As the technology evolved to Level 2, searchable directories and more interactive features were added, providing dynamic new options for HCO marketing and administration departments. It was possible to promote classes and services, help people find reliable current health information and appropriate specialists, make human resources information readily available to employees, and collect and manage data using the Internet. Since Generation 2, portals have leveraged service-oriented (SOA) capabilities. Generation 2 portals provided a rudimentary method of composite application assembly known as interportlet communication. Organizations can use interportlet communication to build composite applications by linking portlets related to a specific business process. This type of composite application is referred to as "on the glass" because the integration is at the presentation layer rather than deep in the business logic. This integration approach is effective for user-driven processes, and advanced enterprise portals use interportlet communication extensively. Level 3 applications required a broader revolution within healthcare from paper to electronic medical records, which was reliant on emerging data standards and the willingness of HCOs to empower their users with more control and access. Generation 3 portals enabled systems to handle basic Web services. These portal products could consume Web services. The addition of workflow, which is a feature of most portal products, introduced a new way to orchestrate composite applications. Over time, the experiences of the early adopters and results of pilot projects generated sufficient results to compel cautious HCOs to pursue the promise of eHealth. With Level 3 adoption no longer stalled by technological limitations and the pervasive wait-and-see mentality, the next wave in eHealth is cresting. Transformational web portals will offer business process management with workflow automation, alerts, and reminders, integration with patient records, medical device uploads and a host of other equally exciting advances. Together, the unified data resources and user interaction will radically alter best-practices for patient care and healthcare efficiency. In February 2006, a survey of healthcare CIO’s ranked the area for which they would be most likely to offer increased functionality via their web presence. Offering patients the ability to schedule appointments through their website was most frequently identified, followed by utilizing a physician portal link and providing consumer health information. However, only a handful of the CIOs report that their website is used to offer patients secure and authenticated access to medical records. Finding themselves repeatedly on the cutting edge of eHealth, vanguard organizations are evaluating the appropriate technical platform for Level 4 applications. With Generation 4, portals started to leverage advanced Web services. This included the ability to provide Web services, as well as consume them. It also supported the first Web services standard for portlets, Web Services for Remote Portlets (WSRP), which enables one portal to consume a portlet from a different portal, using Web services protocols. Thus, portal pages could include local and remote portlets, all supporting a single set of processes. Generation 5 is emerging (see Figure 1.) Advanced features include support for business process management (BPM), service-oriented applications (SOBAs) and orchestration, critical features to support advanced composite applications. Business Process Execution Language will become the standard orchestration language for portal products and will extend beyond the capabilities of their current workflow features. o Improved operations for administrators and clinicians, building on existing skills and significantly reducing unnecessary mundane tasks. Each of these improvements provides additional benefits to each of the stakeholders. By empowering patients, providing rapid, real-time data access, greater efficiency, and increasing patient/ physician collaboration—everyone benefits. However, while many vendors offer partial solutions, few offer a comprehensive portal communication solution. Legacy HIS/CIS vendors offer applications targeting information access and management, and while they improve the physician/patient experience and provide operational efficiencies, the needs of the other stakeholders are not addressed. Traditional web vendors, on the other hand, tend to focus on content management systems that excel at promoting an organization’s brand but leave the needs clinical and operations stakeholders underserved. Somewhat more comprehensive, electronic medical record (EMR) vendors offer vital elements of the big picture solution, but cannot accomplish the complete transformation that browser-based systems promise. 1. Consumerism - Rather than being passive participants in their own healthcare, today’s patients are looking for return on investment and driven by the spiraling cost of health insurance and growing out-of-pocket expenses. 2. Clinical - Advances in service delivery and clinical outcomes through better adherence to clinical protocols and more informed decision-making, reductions in medical errors, decreased morbidity and mortality, and expedited recovery times. 3. Financial - Cost reductions and revenue enhancements from quicker charge capture and shorter billing cycles, productivity gains from all types and levels of staff. 4. Organizational - Improvements in stakeholder satisfaction through shorter wait times, better access to reliable healthcare information, and better relationships with clinicians; higher productivity from increased procedure volume, reductions in the average length of stay, quicker transaction processing turnover, lower administrative staff and resource requirements; more effective risk mitigation, and increased adherence to federal, state, and accreditation organization standards. Current, partial solutions can be made whole with interoperable portals through which all healthcare stakeholders will exchange information and engage the enterprise. Enterprise information portals are intended to consolidate a vast array of information from a multitude of sources onto a single screen. Portal technology enables different IT systems and software applications to communicate, to exchange data accurately, effectively, securely and consistently, and to use the information that has been exchanged. Moreover, a portal strategy should be built on a stable, secure framework, offer single sign-on, single-patient/ single-view access to all information using a coherent system of portals— simultaneously serving the needs of the wide variety of stakeholders. With billions being invested in the migration from paper to electronic records, rapid ROI is a determining factor on the minds of executives and administrators concerned about their bottom line. Speedy, enterprise-wide adoption is critical for any eHealth initiative to realize the full benefits of their investment. Delays and patchwork systems negatively impact the organizations’ ROI. Still, adoption continues to be spotty, despite incentives. In part, the gradual adoption curve can be ascribed to common complaints of HIT; accompanying workflow and systems integrations require process changes that can be intimidating. Reengineering the way work is done presents challenges that extend far beyond use of the technology. Changing the enterprise culture and convincing busy professionals to adopt and learn new systems are essential but challenging components. A study conducted in 2001 found 121 administrators and physicians working for HCOs agreed that in order to remain competitive, providers must move toward interactive consumer web self-service capabilities (e.g. scheduling services, pre-registering for services and bill payment) and online physician patient communication. However, the reluctance to proceed was tied predominantly to a lack of funding followed by a lack of commitment, fear, politics and other intangibles that must be overcome if an organization is to be able to achieve the advanced website functionality. These findings were reiterated in the 2006 HIMSS CIO Leadership survey, which found that for the sixth consecutive year, respondents identified a lack of adequate financial support for IT as the most significant barrier to a successful implementation of IT at their organization. The fragmentation of legacy HIT systems causes interoperability issues that can undermine an organization’s confidence in their ability to successfully implement a comprehensively integrated web solution. The data systems needed for an outpatient setting require a different level of sophistication than those that regulate admissions, discharges, and transfers within in a large hospital. Each system is defined by unique vendor standards, some of them decades old. These hurdles make a seamless, rapid data sharing format seem out of reach. Integration can be tackled with the latest web technology. Using a “virtual electronic health record (EHR)” model, any HCO can connect underlying systems rapidly and cost effectively to deliver views of clinical information through secure, single sign-on, web-browser technology. The virtual EHR is dependent on a decentralized, federated data model. Using this architecture allows HCOs to leverage legacy HIS/CIS investments, avoiding the maintenance of an expensive Central Data Repository (CDR). The federated data model eliminates system integration hassles and overcomes patient identification challenges with master patient indexing logarithms. It seamlessly integrates disparate clinical and census data, transforming fragmented data into a clean and concise dashboard of clinical information. For example, a virtual EHR presents admitting, attending, and referring physicians with ready access to all of their patients’ clinical information and, when combined with systems such as computerized physician order entry (CPOE), provides the ability to input patient order entry and review via a web browser. Additionally, online continuing medical education (CME), calendars, scheduling, clinical trial information, grand rounds, physician newsletters, and relevant clinical content may all be presented in a customizable view for each user. The biggest concern for busy physicians is the time and energy required to transfer data and learn a new system. They are understandably reluctant to spend time away from patient-facing activities to address administrative business. To reduce training time, leading eHealth solution providers devote considerable resources to researching and designing intuitive applications that build on existing user experiences best practices. Additionally, the federated data model eliminates the need for physicians to learn underlying applications for checking labs or reviewing films, as the view they see does not require them to interact with the software, only to view it. Understandably, HCOs and physicians are sensitive to their responsibility to protect confidential patient information and may see rapid, real-time online access to vital information as a threat to privacy. Adequate security measures and an architectural design must be engineered to allow an organization to implement eHealth applications with demonstrable compliance with regulations and respect for the patients’ rights. Authentication protocols and CAPTCHA , encryption of secure messages, automatic audit trails of information access, controlled workflow and secure servers guard patient information from unauthorized access. In the 2006 HIMSS CIO Survey, lack of staffing resources was identified as the second most common barrier to IT adoption. Time and resource efficiencies enabled by eHealth have been demonstrated to pay for themselves in as little as a year. Fewer chart pulls and phone calls, speedier access to accurate information, lower record maintenance, and staffing costs, and revenue enhancements together create a synergy of efficiency—more than compensating for the up-front investments. For example, reducing the need for just one administrator/trainer can save significant financial resources. One estimate based on a 40 hour work week over 50 weeks, and an average annual salary of $50,000, suggests that reducing one full time trainer can yield a savings of $61,000 USD a year. The architecture and design of eHealth products are focused on allowing non-technical users the maximum flexibility to manage their websites and portals. Additionally, intuitive design reduces the need for training and results in an immediate cost saving. eHealth is no longer in its infancy, yet sustained concerns about implementing new technology is understandable. It’s a real challenge for most organizations to create a tactical plan to ensure that their web capabilities support current corporate objectives. It is far more difficult for HCOs to devise a long term plan that serves the evolving needs of the organization, adapts to technological advances, and meets new societal demands. The pressure to deliver on high-priced projects adds gravity to the matter. The initial expenses are just a small piece of the overall financial commitment an HCO makes in the transition to eHealth, and the failure rate for EHR implementations is estimated at 30 to 50 percent. False starts and implementation timeline overruns are too costly for most HCOs to risk. Just as customers accessing their information have reduced banking industry costs, it is a general assumption that the same will hold true in healthcare. As more patients bypass the “hands-on” personal method and obtain information for themselves, it is estimated that great savings will be gained, and consequently, a tremendous amount of strain will be removed from the system. Times have changed: This may not appear to be all that insightful, at first glance, but this premise contains very important building blocks. We are no longer in an era where businesses and governments tell people what to do and when. The rise in consumerism has created the demand from the public for better information and better service. The public wants information in the way they want it, when they want it. We have rapidly progressed through the Information Age into a “Knowledge Era”. Information that is meaningless to consumers has no value. In the next 20 years, the industries that will be successful will be the ones that can take advantage of technology and deliver pertinent information, which is “targeted knowledge” channeled down to the individual consumer. Patients are at the centre of healthcare: We have seen many Hospital Mission statements echoing this same message – changing to patient-centered care. However, this ‘mantra’ has not been firmly understood or appreciated. Without the patient, there is no need for healthcare professionals. The patient is the one constant throughout all of the healthcare system. What patients do want, and will demand, is better information about the system, about who does what services, and about how well they perform these services. Answers to these questions will allow consumers to make informed decisions surrounding their care. Patients want access to their own patient information – and they want to be able to understand what it is that they are reading. In particular, they want to know more about their illness or disease, and they want information on treatment options and success rates. Often, they would like to get in touch with other patients to exchange experiences and to get advice. After all, it is only when they interact with other patients that they get real information about what they are going, or will go, through. Ultimately, patients are the decision makers: When patients are faced with difficult healthcare questions, they seek advice – from their doctors, other health professionals, and their own personal network. Even though the physician will provide the best medical support, ultimately, it is the patient who has to decide whether they want this drug treatment or that surgery. It is understood that not all patients may have the maturity or cognitive ability to comprehend the decisions that they have to make. Many caregivers have used this argument to withhold information; but, in actuality, this rebuttal only applies to a small percentage – perhaps, to 20 percent of our population. The remaining 80 percent have the ability and the right to make their own decisions. What they lack is the medical background in order to facilitate all the information and to process it in order to make an informed choice. It is our belief that in the healthcare system of the future, we will see physicians (and other professionals) act as advisors to patients, rather than the old model, where patients are told what to do. Gone will be the day where patients will feel that they are not free to question facts or to seek options. Decision-makers need information: It is well understood in information theory, and in the decision analysis literature, that decision-makers need information to assist in making any decision. It then becomes clear that we must get the critical information to the patient in order for them to make informed decisions. This means that the focal point of the healthcare system of the future must be on the patient record, since that is the only point where all the data reside. In order to move the data and information around efficiently, it is obvious as well that this record will have to be in an electronic form. Conclusion: Patients must be able to access their health records and other patient information if they are to make informed and effective decisions about their health management. Consequently, it is impossible for patients to manage their health without this requisite information! Over 40 percent of patients have at least one chronic illness, accounting for nearly two thirds of all medical expenditures. Because of their long timeframe and high attendant costs over time, chronic illnesses lend themselves to electronically mediated self-management tools. Prototypes of web-based, patient-centered Information and Decision Support Tools have been demonstrated to improve self-management of illness and enhance understanding of the complications of poorly controlled disease. Patients living with chronic illness are also more likely to use health information than their healthier counterparts, although each chronic illness has specific, recognizable challenges for affected patients in symptom comprehension, information management, task fulfillment and social interaction. It is our hypothesis that leadership will come from these chronically ill patients (either individually or within a group) by demanding better access to health system and service information. In recent research, we interviewed patients on a number of “access to information” issues. Unfortunately, asking patients (or computer end-users or stakeholders) what information they would like to receive is not efficacious due to the fact that end-users are normally not well versed in “system options”. Almost two-thirds of these lung transplant patients (63 percent) had seen some portion of their medical record (most commonly blood work or X-ray results) and a similar percentage believed a personal medical record would help them manage their personal healthcare. The most common reason respondents wanted access to their medical chart was to enhance their understanding of their medical condition. This desire to have further access to personal medical information was expressed despite a comprehensive patient education program provided by the transplant program, and despite the fact a high degree of patients felt they were provided with an adequate degree of information upon discharge from hospital. As a whole, this group appears to have a high level of interest in their medical information and can be described as active participants in their care. • 57 percent of patients believe that access to their medical information would help enhance their understanding of their medical condition. • 13 percent of patients indicated that access to their medical information would help ensure the information was available to their family doctor. • 13 percent of patients felt access to this information was important in case of an emergency. Further, over 60 percent of patients believe that having access to information about the medical care that they receive would help in managing their healthcare while at home. The difference in the phrasing of each question may illustrate the importance patients’ place on information necessary for self-management over information about their hospital stay. Sixty percent of patients believe that if they were provided with their medical record, they themselves and their family physician would use it the most. Related to the use of the patient’s medical record, 73 percent of respondents did not have any concerns about a family physician, family members or other medical specialists having access to their record. Patients were also given the chance to choose what type of information from the hospital they would find useful to help manage their care at home The most popular choice was the lab test and results (67 percent) followed by a summary of their medical history, medication information (history and current), contact information (specialists and emergency contacts) and blood pressure/ temperature charts. Family and personal history and height/weight charts were not strongly endorsed. Only 17 percent of all respondents felt the inclusion of an allergy history was necessary in their personal health record. Given a choice, 63 percent of patients would want this information as a paper copy. Other preferences included CD (13 percent), secure Internet (13 percent), and other storage device (10 percent). Forty-seven percent of respondents indicated that they would find it useful to have the entire lung transplant manual in an electronic format. The survey indicates that lung transplant patients are interested in accessing their personal health information to support their health management. At the time of the survey, well over half of the sample group was connected to the Internet and according to the literature, it can be expected they are accessing health information through that medium. This desire stems from increased self-reliance in the management of personal health and the desire to take a more active role in the medical decision-making process. While the effect that this information may have on patient health outcomes is not clear, access to personal health information is associated with improved patient satisfaction. As patients move to a more self-reliant role in the management of their health, the demand for personalized information will only increase. Conclusions: We must begin to put pressure on the system to support patients in gaining access to their own health information. As presented herein, this is needed and soon will be demanded. Ultimately, this inevitability has been framed by the term Patient Destiny, where patients are actively involved in all healthcare decision-making. This is an infeasible proposition in a paper-based system, which means we must move to more Electronic Health Records or EHRs. Since patient access to individual healthcare provider organizations’ health record systems appears to be almost as unviable, due to limitations in data format, unique patient identifiers and system constraints, one appealing approach is to follow the path whereby patients interface with their health-related information across the many providers in a Web 2.0 environment. • Design a reward system for their investment in health, well-being and where health-conscience behaviour is rewarded within a ‘point collection’ system. In essence, a health sector-wide strategy of patient awareness and education is now required. All consumers of healthcare – the healthy and the ill – need to be presented with a forum for a comprehensive discussion on healthcare, one that deals with the trends of rising consumerism and greater expectations relating to information access and delivery. We must promote an “effective and coordinated consumerism” perspective within healthcare. Hopefully, this will provide an incentive to all consumers to become more involved in their own care and health management and to demand more from health providers. Kevin J. Leonard is Associate Professor in the Dept of Health Policy, Management & Evaluation, University of Toronto. David Wiljer is Director, Knowledge Management and Innovation, at Princess Margaret Hospital, University Health Network, Toronto. Hamilton Health Sciences worked with Medseek to design and implement the ClinicalConnect portal, but also engaged physicians from a variety of disciplines to offer input and drive the creation of the final product. Since Meditech is the most widely used information system at Hamilton Health Sciences, it was the first to be merged into the ClinicalConnect environment. ClinicalConnect offers a user-friendly view of the Meditech information, which ranges from admission information to lab results, and allows physicians to view the information simply by signing on to ClinicalConnect. The next step involved adding views of patient records, stored in a system called Sovera. Currently the charts are scanned and merely displayed through ClinicalConnect, however, the portal does allow physicians to view the information and also indicates the number of chart deficiencies that need to be resolved. By the end of this year, physicians will be able to access Sovera directly through ClinicalConnect, which will enable them to interact with patient information in real time and directly resolve any chart deficiencies. In the future, physicians will have the option to e-edit and e-sign Meditech-based charts in the portal, and the updates will be passed back to the Meditech system. When this feature is available in the portal, it will also be available via PDAs. "Canadian Implementation of e-Health projects increases by 39 per cent"
Initiatives benefiting patients in every province and territory. Toronto, ON 06/25/2007: -- Canadian patients are benefiting from a 39 per cent increase in electronic health initiatives that are modernizing the way clinicians deliver health care, announced Richard Alvarez, President and CEO, Canada Health Infoway (Infoway). "In the past year, we've seen tremendous growth in the number of electronic health record initiatives that are delivering enhanced patient care, shorter wait times and a more productive health care system for Canadians," said Alvarez, who recently released Infoway's annual report. "While this growth is encouraging, momentum must be maintained so we can capitalize on the efficiencies generated through electronic health initiatives as our population continues to age and grow." 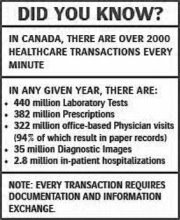 In 2006-07, Infoway approved investments of $518.9 million in EHR initiatives across Canada, surpassing its target of $335 million. The digitization of diagnostic imaging, Drug and Laboratory Information Systems projects and the interoperable electronic health record made significant progress. With 227 projects complete or underway across Canada, Infoway and its partners are investing in modern health information systems that are uncovering efficiencies in healthcare settings across Canada. The result is better patient care and outcomes, reduced wait times and cost savings. Infoway's plan for further electronic health progress is outlined in 2015 -- Advancing Canada's next generation of health care, its long-term strategic vision document. The document is available at www.infoway-inforoute.ca.